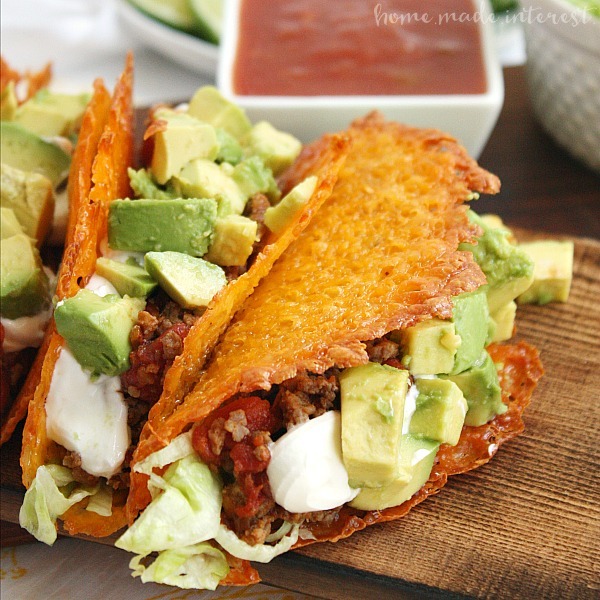 Cheese Taco Shells for a Low Carb Taco Night! - Home. Made. Interest. 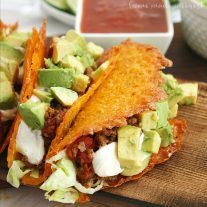 Home » Recipes » Main Dish » Cheese Taco Shells for a Low Carb Taco Night! Cheese Taco Shells for a Low Carb Taco Night! Have a low carb taco night with these Cheese Taco Shells made from baked cheddar cheese formed into the shape of a taco! It’s an easy keto dinner recipe you’re going to love! Step 1: Start by lining a baking sheet. You can use parchment paper but a silicone mat is the best because the cheese comes off easily every time. Then you drop little piles of shredded cheddar cheese on to the sheet. For cheese taco shells I suggest using about 1/4 cup of cheese per shell. Step 2: Place the baking sheet in the oven and bake at 350 degrees F for 5-7 minutes, or until the cheese has melted and the edges begin to brown. It’s important to wait until those edges start to get crispy because you’ll get the crispiest cheese taco shells that way. Note: Cheese does release grease as it bakes. You can dab your shells lightly with a paper towel before the next step if you would like to remove some of the excess grease. Step 3: Shape your cheese taco shells. Use two glasses and sit a thick handled spoon (or whatever utensil you have) across the glasses. You’ll want the handle to be thick enough that it will leave a space of about 3/4″ in the curve of your taco. It doesn’t have to be precise! Let the cheese cool for a minute then lift it off of the baking sheet and drape it over the spoon handle. 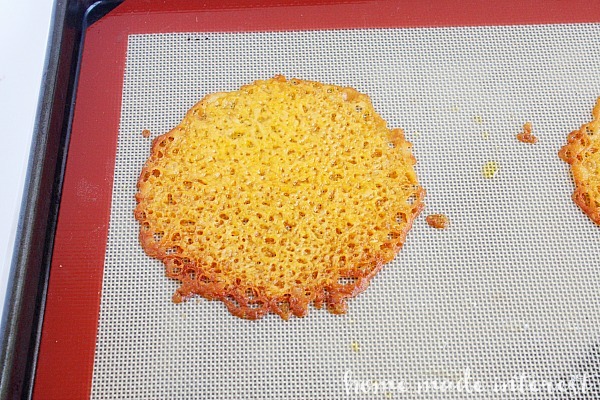 Let it cool completely, this only takes about 5 minutes, and you have a low carb taco shell! Want to try a different shape? 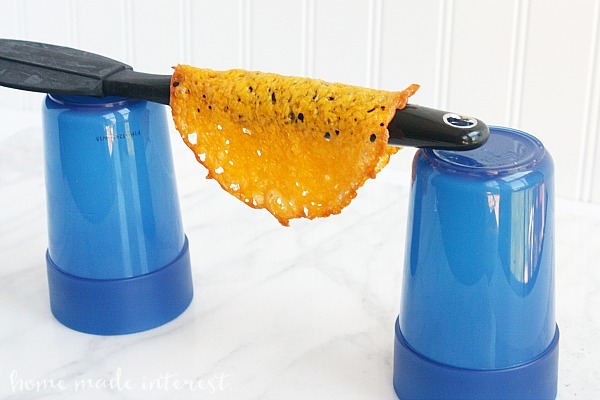 These cheese taco shells are easy to mold. 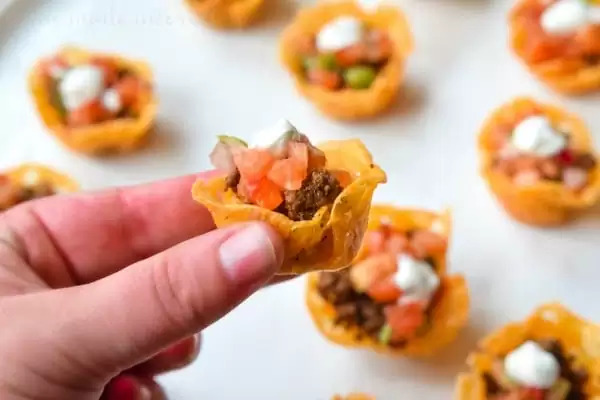 We used a mini muffin tin to make our Low Carb Taco Bites! Now you just need something to fill that shell with. I make a simple low carb taco meat using my homemade taco seasoning and ground beef. I cook the beef, drain the grease, add a little water and the taco seasoning and simmer them together until the water is evaporated. Then I add the taco meat to my low carb cheese taco shells and top it with avocados, sour cream, and a little pico de gallo. Like this recipe? Pin it to your Low Carb Recipes board! Have a low carb taco night with these cheese taco shells made from baked cheddar cheese formed into the shape of a taco! Toppings for taco: Sour cream, avocado, cheese, lettuce, etc. 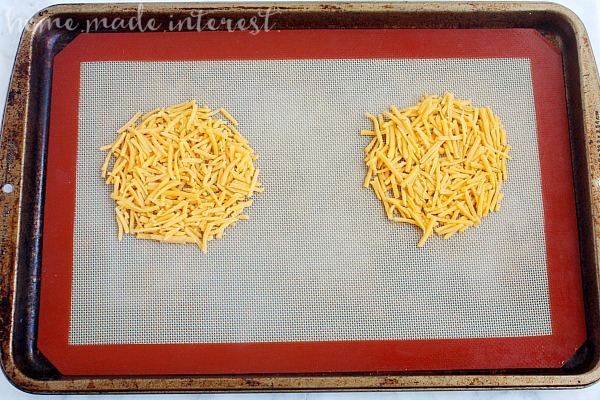 On a baking sheet lined with parchment paper or a silicone mat place 1/4 cup piles of cheese 2 inches apart. Press the cheese down lightly so it makes one layer. Place baking sheet in the oven and bake for 5-7 minutes or until the edges of the cheese are brown. Let the cheese cool for 2-3 minutes then lift it up and place it over the handle of a spoon or other utensil that is balanced on two cups. While you continue to bake your cheese taco shells place the ground beef in a skillet over medium high heat cooking until it is completely cooked through. Drain the grease from the meat and then add the cumin, chili powder, onion, powder, garlic powder, and salt. Pour water into skillet and stir everything around mixing it together. Simmer for 5 minutes or until liquid has cooked away. Add meat to taco shells and top with your favorite taco toppings. Love it!!! New to keto, 3 months in, still learning so much about food i once though was healthy is not.. I see via Keto where and why I failed so many diet before. This week is a great week, frist i learned about keto coffee and you just showed me how i can have tacos again. THANKS! Thx, can i ask you about the difference of fiber carbs and regular carbs? Read today that I dont need to count them, but as a rule i go by total carbs. I use an app “lost it” of an on since 2013 so I stayed with what I know tl track my food…but now i have tons on great info and can tweek my diet. Thx for your encouragement and for your help and such a great article. Look forward to reading more. I’m happy to answer any questions. I’m not expert but I can answer from my own personal experience. Net carbs are calculated by subtracting fiber and sugar alcohols (used in a lot of sugar free sweets and baking) from the total carb count. When doing keto I stay under 20net carbs per day. That keeps me in ketosis (some people can go higher but this tends to be the standard #). Counting net carbs rather than total carbs gives a few more options especially when it comes to things like nuts, vegetables, and avocados. thank you, this helps me so much. Oh, I made the tacos the other night for the family, they loved it!!! Am I missing something… How do you get the cheese to not stick to the parchment paper? I’m not sure why it would stick to your parchment paper like. I have never had that problem. I loved it but I had the same problem. Why is it sticking to my parchment paper ???? Could it be because some parchment paper is only one sided? aka the shiny side needs to be up? Do you have the nutritional content for this meal? Hi Amee, this recipe is 3 net carbs per taco not including any toppings you might add. Do they keep well? I mean, if I made a dozen and used them through the week. I’ve definitely made them a day ahead of time and stored them in an airtight container and they were fine. I’m not sure how long that will work but I would think 2-3 days at least. I loved this idea and tried it with mozzarella instead as it’s all I had and it worked great! When I tried it again with cheddar it did not work at all. The cheese wouldn’t brown.. I will stick to mozzarella from now on. very cool idea. i can see this being super useful. have you tried making in bulk and freezing? Well that was an epic fail. Stuck all over the parchment paper. Would not separate at all. I’m so sorry you had that issue. Parchment paper is supposed to be coated on both sides with silicone which makes it non-stick but some people have commented that some brands may only coat one side. Does your paper have one side that is shiny? If so, that is the side the cheese should go on. Hi Lisa, they are the best when you eat them right away but I have made them up to 1 day in advance and stored them in an airtight container and they still work and taste great. Are the cheese shells greasy? Cheese can be greasy when it is heated. I usually pat mine with a paper towel to get extra grease off of them before eating. Love this. It came off my parchment paper, but they aren’t setting up, meaning keeping their shape. Am I doing something wrong? Do I need to cook them longer? You probably just needed to cook them a little longer. It takes a little practice but it is totally worth it! This sounded really good but the cheese taco shells did not work very good…they were dripping in oil off the cheese and when you added the warm meat the shell melted……..but i might try it again. Hi Kelly, I do pat mine with a paper towel before forming them into a taco shell to remove any extra oil. I have never had my shell melt though. Maybe let the meat cool a little more? 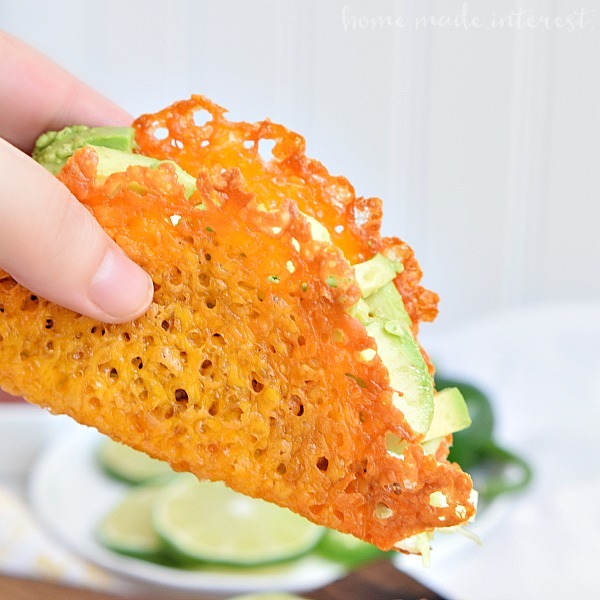 Made the cheese taco shells…..OMG…..They came out perfect!!! Thank you!! So glad you liked them. They are one of my favorite low carb dinners! Would microwave work as well? Yes! You have to play around with the amount of time because every microwave is different but it does work. When you store them in air right container do you refrigerate them? Yes, I kept mine in the refrigerator. I just took them out before cooking my meat to give them time to come to room temp. Hi Katrinka, Welcome to keto! We have a lot of low carb recipes here https://www.homemadeinterest.com/category/recipes/low-carb/ . I recommend the meatloaf!! It’s 3 net carbs per taco. This does not include any toppings you might add. How many carbs in your tacos? Can’t wait to try the cheese taco shells!! These are delicious! Any idea the carb count? I used a lot less cheese as 3oz was too thick. Hi Laura, the shell itself is about 1 carb per ounce of cheese. 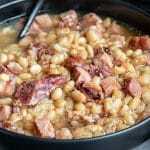 Great recipe I could eat this all day everyday (DON’T DO IT) ???? I found that this also helped me to understand the Keto lifestyle because it is a life style change. I’m so glad you liked it. Good luck on your keto journey! This looks so good, yet my meat mixture doesn’t taste good. It seems over-spiced. Are these by any chance supposed to be teaspoons instead of tablespoons? Hi Kim, you can reduce the amount if you like. I would suggest 1 tbsp cumin, 2 tbsp chili powder. If you want less chili powder you can go down to 1 tbsp. Even if a little spicy, they were good. We will reduce for next time. I made these. I didn’t have an issue with the cheese sticking to the parchment paper. They had to cool enough first. And I used full-fat cheese so there is a lot of oil. My issue with them was – hot taco filling inside a cheese taco. Think about that for a minute. Yup. Equals mess. I didn’t think that part through. Imagine filling, sour cream, avocado – everything falling into your hand. What a mess.I won’t be making again. I like a hot taco, not a cold one. But I do apprecaite the idea of it. Thank you. Oh wow, that must of been one hot taco! Our taco filling is usually warm and holds up. Maybe try a using a harder cheese, they melt at a much higher temperature. Made this just now and it came out just like your picture and so delicious! To avoid it sticking to my parchment paper I just used a light cooking spray. Thanks for sharing this recipe! Can i use wax paper or aluminum foil with cooking spray? Hi Dennis, If you use cooking spray on aluminum foil it might work but no guarantees. I would be afraid wax paper would melt. Great recipe! I made them tonight. I also had massive challenges getting the tacos off the paper, they shaped perfectly and I figured a bit of paper shouldn’t kill anyone!! I did this and it turned out great however, the shells came out very small at 1/4 cup. Next time I will almost double this to get a full sized taco. So glad they worked for you and you liked it!